The Rev. Jane Gerdsen is the Missioner for Fresh Expressions in the Diocese of Southern Ohio. She is the founder of Praxis Communities, a diverse network of emerging Christian communities. She works with young adults, immigrant communities and those who have been disenfranchised from the church in some way. She has a heart for those on the margins. She has served as the chair of the Episcopal Church's Advisory Group for Church Planting and Missional Initiatives. 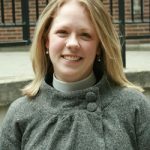 Prior to her work with Praxis Communities, she served for five years at St. Andrew's, an inner city church in Dayton, OH. She is also a wife and mother to two young children.